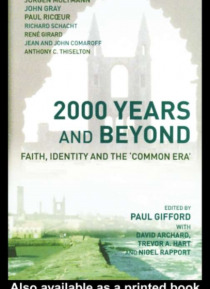 2000 Years and Beyond brings together some of the most eminent thinkers of our time - specialists in philosophy, theology, anthropology and cultural theory. In a horizon-scanning work, they look backwards and forwards to explore what links us to the matrix of the Judaeo-Christian tradition from which Western cultural identity has evolved.Their plural reflections raise searching questions about how… we move from past to future - and about who 'we' are. What do the catastrophes of the twentieth century signify for hopes of progress? Can post - Enlightment humanism and its notion of human nature survive without faith? If the 'numinous magic global capitalism' is our own giant shadow cast abroad, does that shadow offer hope enough of a communal future? Has the modern, secularized West now outgrown its originating faith matrix? Often controversial and sometimes visionary, these seven new essays ask: how do we tell - and rewrite - the story of the Common Era? Introduced by Paul Gifford, and discussed in a lively dialogic conclusion, they add their distinctive voices to a debate of profound and urgent topicality.